For centuries, wood furniture and fixtures have stood the test of time bringing warmth and beauty to New Jersey and New York homes. We all know wood is stable and strong and some innovative solutions available today can help minimize damage from harmful environmental factors – rain, extreme temperature variations and pests. But, even with new paint and pest control treatments, wood still requires a good deal of maintenance to keep your assets beautiful and functional. 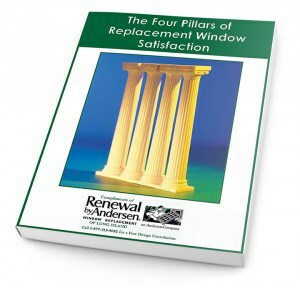 This week, our Renewal by Andersen of New Jersey and New York Metro blog post will take a look at the significant differences in wood and vinyl replacement windows, compared to our patented Fibrex frames. First, let us say that vinyl and wood components aren’t totally taboo. We offer a sleek contemporary, sliding patio door that features natural pine interiors with traditional mortise and tenon joints. As a protective measure, we coat the exterior wood portions with a special urethane finish that adds a layer of protection against the elements. And, the wood frame is wrapped in a vinyl sheath, so buyers get the strength of wood, with the low-maintenance finish that vinyl provides. Our customers tell us that the large viewing area, as well as the easy-glide track system are definite positives. However, when it comes to replacement windows for your home, we recommend Fibrex frames (exteriors) and, if you like the warmth of wood, wood interiors – no vinyl. Here’s why. Vinyl definitely has a place in modern living – we hear that vinyl records are making a comeback and more people are seeking out the rich, unmistakable sound that “clean” records offer. According to audiophiles, compared to CD’s there really isn’t a comparison. The same is true for replacement windows with paintable/stainable wood interiors. If you appreciate the elegance that natural wood offers, you know exactly what we mean. Each wood type has its own unique grain and texture. You can stain the surfaces to complement your interior décor, or paint to contrast your walls or molding. You could try to paint or stain vinyl frames, but in order to get the paint to adhere, you would have to rough up the surface with sandpaper or steel wood – which wouldn’t leave a smooth, beautiful finish. Wood is a “natural” insulator. This means it improves the overall energy-efficiency of your home. That’s a good thing, but, it is susceptible to mold and moisture damage. Not good. Unlike wood, vinyl cannot degrade over time from rot or mildew. That’s a good thing. However, vinyl windows have a tendency to pull away from the building envelope because the thermal expansion rate is different than the home’s brick or wood exterior. This results in gaps which allow moisture and air to sneak into your home. Air and moisture leaks reduce energy-efficiency and may lead to excessive condensation which could ultimately damage interior window surfaces and your walls, floor and furniture. Not good! Fibrex frames are guaranteed not to rot, peel, flake, rust, pit, mildew, fade or need resurfacing to perform exactly like they did on installation day. A full palette of exterior colors allows homeowners to complement their existing exterior color scheme. And, with wood interiors, you can have the warmth and richness that real wood delivers. Long-lasting exterior colors look just like painted wood from the street – and close up, too. New Jersey & New York metropolitan homeowners get the best features that all the frame materials have to offer rolled up in one beautiful, easy care package. If you prefer the look and stability of wood, but aren’t crazy about having to repair and resurface your exterior window frames every year or two, take a closer look at Fibrex frames by Renewal by Andersen of New Jersey and New York Metro. You get 100 percent of the benefits of wood, without any of the negatives. Plus, you have low-E glass options and standard and custom grille patterns that let you design the perfect window for every room in your home. With standard and specialty shapes, patterned glass and exclusive hardware choices, we know you will love your replacement windows for as long as you live in your home. Ready to see samples and talk about features and accessories? Fill in the short form on this page or give us a call today at 1-888-826-2451.